This estate at the northern tip of Shetland and Britain extends to 4,707 acres. It comprises ten parcels of land, eight of which are on Unst, and includes a number of houses and agricultural buildings. 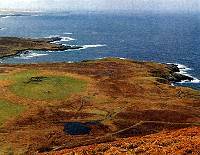 The smallest parcel is the 30-acre island of Daaey, off Fetlar. Most of the land is in agricultural use and there is a first-class Shetland pony stud. Scenically the three west coast areas of Woodwick, Collaster and Lundare are outstanding, with undulating hills, low rocky coastline, beaches, cliffs and voes, all typical of Unst as a whole. The area is of geological, botanical and ornithological importance. There is an interesting wood, the only one on Unst, at Halligarth, containing mostly sycamores. Ferry from Aberdeen to Lerwick, then (via two ferries) by hired car or bus to Unst.